Carry Fi Fi one day and you will be hooked for life. 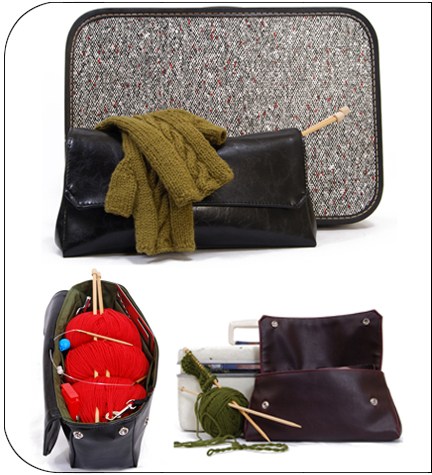 Fill it with your knitting and tools, throw it in you bigger bag, and you´re ready for everything. Not knitting today? Simply leave your clutch at home. No muss, no fuss: beats a Ziploc any day! Fi Fi is an essential addition to every knitter´s tool stash. Here’s what Terrye says: WOW! I just love this bag, it’s soft, and elegant and just the perfect size for, well, all of the above. It easily carried all of my yarn, plus “finished pieces of project” plus accessories and pattern with no effort, I love how you can just take it with out, or take it out of your everyday bag. And, you know what else I put in it? 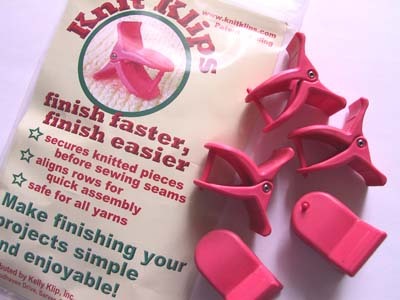 KnitKlips! To finish my Sunrise Circle Jacket of course. At first glance, and when first starting to use these I wondered why, when dollar store hair clips were available, would I buy these, but then the magic happened. There’s only one spike, rather than several teeth meshing together. They’re big enough to be easy to use and they hold fast even when trying on your garments. They don’t snag on your knitting. I was sold about 30 seconds after using these. Definitely worth the cost it almost makes finishing your projects as much fun as knitting them! So, now that Sunrise Circle is completed, well except for the very cool buttons I got at the Fiber Festival, I’m not liking it. Actually, laying on the counter, it’s gorgeous, if I do say do myself, however when I put it on… not so much. Guess I don’t look as much like the model as I would like to believe! Maybe one of my willowy daughters will get an early birthday present…. I have the FiFi, and I love it. I live in Bellingham, WA, where the bags are made. They have a little storefront where they sell items made by local crafters–including some local yarn. I saw the FiFi in the window and thought it was a nifty little purse. I was even happier when I saw it was a nifty little knitting bag–and I had been looking for one. They have one that is a size smaller (good for those who knit socks or scarves) and one that is larger. Right now I am making a baby blanket, and it easily fits in the FiFi.